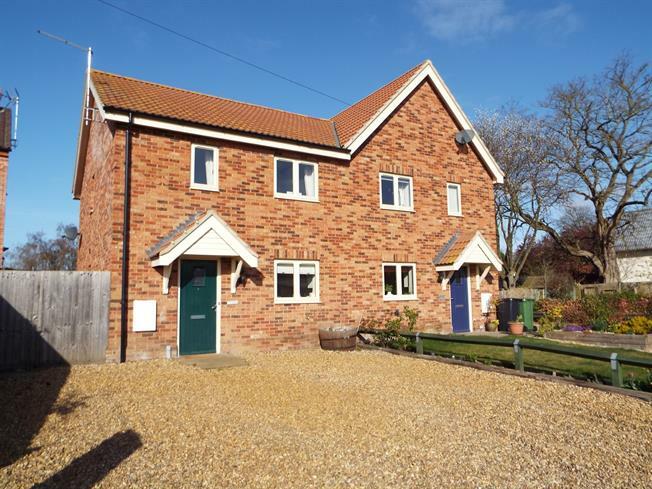 3 Bedroom Semi Detached House For Sale in King's Lynn for Guide Price £215,000. This modern semi detached house has a lounge, kitchen diner, ground floor cloakroom, first floor bathroom and three bedrooms. It has an enclosed rear gardens with access to the side, a single garage and parking for up to four cars. The property benefits from having air source heating which provides under floor heating to the ground floor, radiators to the first floor and hot water. The property over looks field views to the front aspect and is situated in a small village location with easy access to Fakenham and the North Norfolk coast. Front door into entrance hall. Ceramic tiled wood effect flooring with under floor heating. Ceiling light. Stairs lead to first floor with small open area under. Door to ground floor cloak room. Doors to lounge and kitchen diner. WC. Hand basin. Tiled splash backs. Obscure window to the side aspect. Wood effect tiled flooring. Ceiling light. Extractor fan. Shelving. Modern fitted kitchen with a range of base and wall cupboards with work surfaces over. One and a half bowl stainless steel sink and drainer with mixer tap over. Built in cooker with hob over and extractor hood over. Integrated fridge freezer, washing machine and dish washer. Tiled splash backs. Window to the front aspect with views over open fields. Ceiling light. Door to pantry cupboard shelved. Under floor heating. Window to the rear aspect. Door to the rear aspect. Carpet. Two ceiling lights. Window to the side aspect. Loft access. Radiator. Carpet. Doors to bedrooms and bathroom. Two windows windows to the front aspect over looking fields. Double doors to built in wardrobes. Doors to fitted wardrobes. Carpet. Window to the rear aspect. Ceiling light. Radiator. Carpet. Panelled bath with glass shower screen, shower attachment hose over. WC. Pedestal sink. Heated towel rail. Vinyl flooring. Extractor in ceiling. Part tiled walls. Wall mounted shaver socket light. The front of the property is approached over a gravelled driveway providing parking for up to two vehicles. There is side access which leads to the enclosed rear garden which is mainly laid to lawn with a patio area. There is a gate that leads from the rear of the garden to a personal door to the garage on the side of the garage, up and over door to the front with two parking spaces in front of the garage.